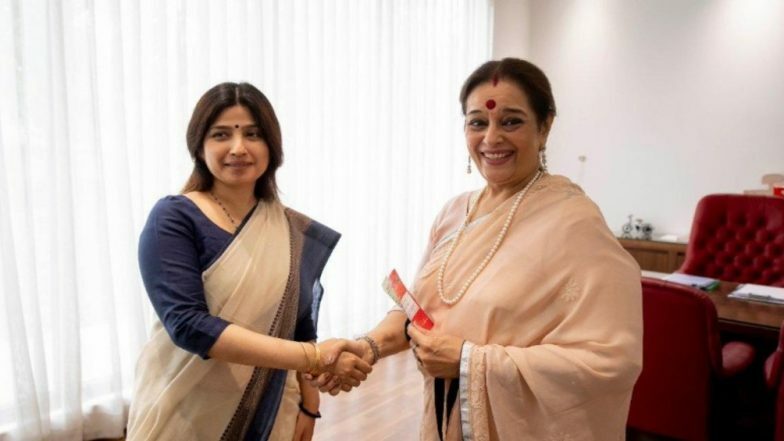 Lucknow, April 16: Indian National Congress leader Shatrughan Sinha's wife Poonam Sinha joined Samajwadi Party on Tuesday in Uttar Pradesh's Lucknow. Poonam joined the SP in presence of party chief Akhilesh Yadav's wife Dimple Yadav. According to reports, Poonam will contest against the Union Home Minister Rajnath Singh from Lucknow Lok Sabha seat. Shatrughan Sinha, Veteran Actor and Former BJP MP, Joins Congress Ahead of 2019 Lok Sabha Elections. Poonam will contest on the SP ticket with the Bahujan Samaj Party's support. The Congress sources said that the grand old party has decided to not field any candidate from Lucknow and will support Poonam from the Uttar Pradesh capital. "Jitin Prasada was keen to contest from Lucknow and he had to be persuaded to opt for his constituency Dhaurhara. Decks have now been cleared and Lucknow will be one of the seven seats that the Congress has said that it would leave for the SP-BSP alliance," said a Congress functionary. In 2014 general polls, Rajnath Singh won the Lucknow seat will 55.7 per cent of total 10,06,483 votes polled. Meanwhile, earlier this month, Shatrughan Singh joined the Congress in New Delhi and will contest from Bihar's Patna Sabha Parliamentary constituency.